Above: Artist’s impression of a gamma-ray burst — by tracking these powerful explosions the distribution of matter throughout the Cosmos can be traced. Astronomers have found a mind-bogglingly large structure — so big it takes light 10 billion years to traverse — in a distant part of the universe. The discovery poses a conundrum to a fundamental tenet of modern cosmology, which posits that matter should appear to be distributed uniformly if viewed at a large enough scale. The newly found structure is more than double the size of the previous record-holder, a cluster of 73 quasars referred to as the Huge-LQG, or Large Quasar Group, which spans 4 billion light-years. It is six times larger than the 1.4-billion-light year diameter Sloan Great Wall. Light travels at about 671 million miles per hour, or about 6 trillion miles per year. 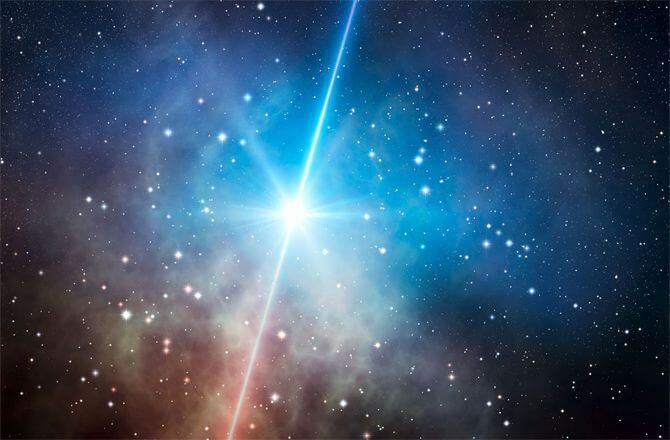 Scientists found the new structure by mapping the locations of gamma ray bursts. These fleeting, but high-energy outbursts are believed to be caused by exploding massive stars. “It’s a great tracer of where something was,” astronomer Jon Hakkila, with the College of Charleston in South Carolina, told Discovery News. Because bigger stars form in areas with more material in general, gamma ray bursts can give astronomers a rough estimate of how much matter a particular region contains. “We’re treating each (gamma ray burst) source as if it’s a pin in the map and it’s sticking to something,” Hakkila said. After accounting for potential survey biases — such as NASA’s Swift telescope and other gamma ray trackers looking more often in one part of the sky or another — scientists found a region roughly 10 billion light-years away in the direction of the constellations Hercules and Corona Borealis that had a disproportionate number of gamma ray bursts. Extrapolating from the locations of the bursts, scientists estimate the structure from which they came spans approximately 10 billion light-years in diameter. “This is probably a large concentration of galaxy clusters and other normal matter,” co-investigator Istvan Horvath, with the National University of Public Service in Budapest, Hungary, wrote in an email to Discovery News. Additional monitoring of gamma ray bursts should provide more evidence for the structure’s existence. For now, Horvath says he has “no idea” how something that big could have evolved. The research appears in the online archive arXiv.org (arXiv:1311.1104 [astro-ph.CO]).